Ana Duncan works primarily in bronze and ceramic from her studio in Churchtown, Dublin. The female figure has been a subject to which she constantly returns. 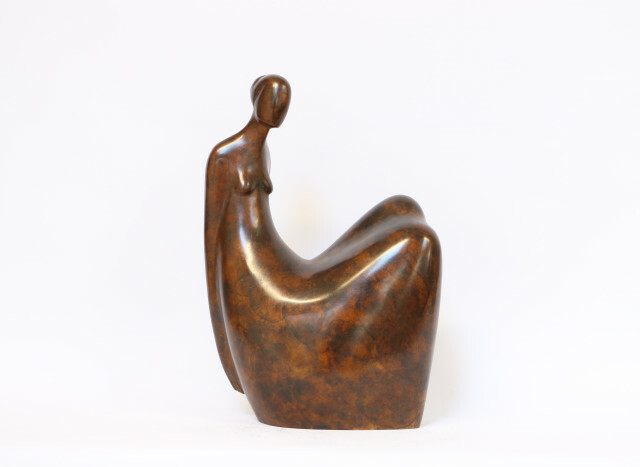 Her main influences are the work of Henry Moore, Barbara Hepworth, Botero, Picasso, FE McWilliam, among others, and the simplicity of Brancusi. In 2015 she completed a 2.5m high Stainless Steel Public Sculpture in Nashua, New Hampshire, USA. She has just completed a large Scale Public Commission in China, and is currently working on a second. Other public commissions include a life size Mother and Child for Tallaght Hospital, Dublin. Duncan has exhibited in numerous galleries and exhibitions in Ireland since 1992 including Royal Hibernian Academy, Royal Ulster Academy, Claremorris Open, Boyle Arts Festival, Sculpture in Context at Fernhill Gardens, Dublin Castle, and the National Botanic Gardens. Her work has also travelled to exhibitions in Belfast, Boston, Britany, London, Paris, and Scotland. She has had solo exhibitions in 2004 and 2010, and has been involved in many two and three person exhibitions in several galleries including the National Botanic Gardens in 2015. Her work is represented in the collections of the Office of Public Works, Department of Finance and Personnel, Northern Ireland, Morrison Hotel, Tannery Restaurant and several other private collections in Ireland USA, UK, Sweden, Spain and Portugal.